Today marked the culmination of the Leicester Summer School which ran for five days starting on Monday 18th July 2016. About twenty young enthusiasts attended the retreat. The sharing on the final day included an invocation to the goddess of learning Bhavani. Kaviraj Singh prepared the participants as part of the morning assembly prayer. In the second presentation Sitar ensemble of the preliminary group played Alap, Jor and Thok Jhalla in Raga Bhairavi. A great achievment as these youngsters learnt to play around a chosen group of Raga phrases, extending them and also playing them in Alap and Jod styles. They finished this part of the performance with a Thok Jhalla style Rela with some tihayis and Ghaseet (slide) insertions. This item was prepared by me and I was very happy with this experiment of preparing a simple yet systematic Alap and Jod. The two Tabla players taught by Kaviraj Singh, who is a Santoor player and a vocalist, helped out by sharing his Tabla knowledge. They played a Kayada with variations and two Tukdas in Teental. In the third item, the preliminary Sitar players, joined by the Tabla’s played teental Nagma/Lehra in Raga Bhairavi, demonstrating the five Jatis – Chatiusra(2,4,8), Tisra (3,6), Khand (5), Misra (7) and Sankeeran (9). Again this was an experiment for me as I tried this approach for the first time and was very pleased with the idea of attempting this intricate idea fitting the Jatis in a steady tempo of 36 bpm. The next item included three young singers who presented Raga Bhopali. Gunwant Kaur had prepared these youngsters a Sangam Geet and a Tarana. A great achievemnent for these talented youngsters for a week’s work. Gunwant teaches with great love and affection. 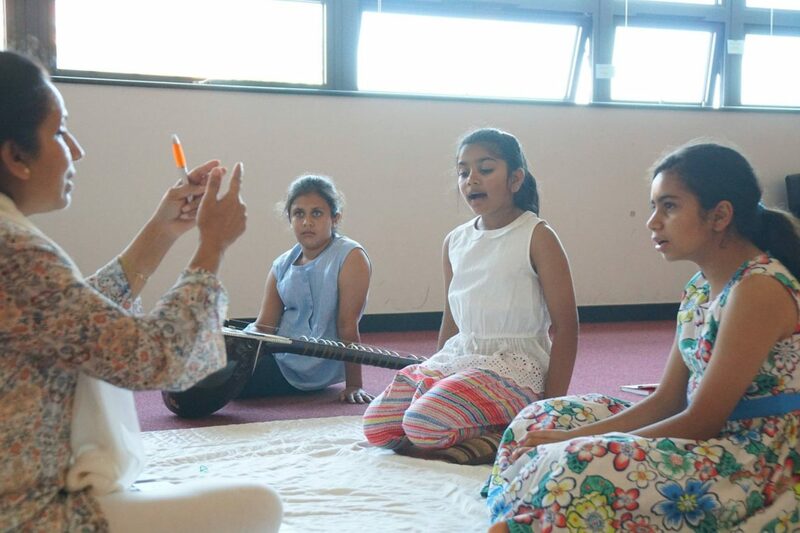 The final item was led by the talented Leicester based Sitarist Roopa Panesar sharing along with the students a selection of three compositions in Raga Bhairavi. The music of these talented players surely left all listeners mesmerised. A great improvement indeed and an accomplishment for the summer school. Thanks to all the tutors and helpers for making this possible and indeed to the Sitar Music Society for supporting and making it happen. Student feedback was very positive and all wanted a longer retreat. Look forward to the next summer school in 2017.